For the American composer, see Paul Alan Levi. For the picture framer, see Paul Levi (picture framer). 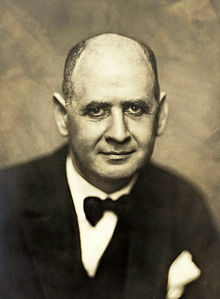 Paul Levi (March 11, 1883 – February 9, 1930) was a German Communist and Social Democratic political leader. He was the head of the Communist Party of Germany following the assassination of Rosa Luxemburg and Karl Liebknecht in 1919. After being expelled for publicly criticising Communist Party tactics during the March Action, he formed the Communist Working Organisation (KAG / Kommunistische Arbeitsgemeinschaft) which in 1922 merged with the Independent Social Democratic Party. This party, in turn, merged with the Social Democratic Party a few months later and Levi became one of the leaders of its left wing. Paul Levi at the 2nd World Congress of the Comintern, 1920. As leader of the KPD, Levi frequently criticized "putschism," or the repeated efforts on behalf of Communists to take power without the broader support of the masses. He first observed this phenomenon in the failed revolutionary experiences in Bavaria and Hungary in 1919. Later on, after the disastrous March Action, Levi wrote his most famous pamphlet Unser Weg: Wider den Putschismus. In it, he laid out his criticisms of the Comintern, the KPD, and what he called the "Bakuninist" influence behind what he argued were numerous premature attempts to take state power. Levi cited both Engels and Marx on insurrection, showing how other Party members of the KPD had overlooked the careful preparatory work of the Bolsheviks leading up to the October 1917 Revolution. He simultaneously criticized Comintern representatives such as Béla Kun, Grigory Zinoviev and Karl Radek for their encouragement of these accelerationist policies both in Germany and Italy. Levi's criticism of the Comintern and "putschism" served as an early attempt to explain the failure of European Revolutions in the 1918-1923 period. Following the failure of the uprisings Levi was expelled from the Communist Party for publicly criticizing party policies in his pamphlet Unser Weg. :20:516 Lenin and Trotsky substantially agreed with his criticisms, but not the way in which he had made them. Lenin sent him a private letter through his friend Clara Zetkin, in which he asked Levi to accept the expulsion for "breach of discipline" and then adopt a friendly approach towards the KPD and cooperate with it in the class struggle in a loyal manner. If Levi would do so, Lenin would then push for his reinstatement in the party. :517–18 Levi did not accept this proposal and continued to criticize the party sharply and condemn its leaders. this led Lenin to revise his previously still favourable attitude towards Levi. Because of his Jewish roots, he became the target of a hateful anti-Semitic campaign in the press. He responded by attacking prominent Nazis, such as Adolf Hitler, Ernst Röhm, Alfred Rosenberg and Wilhelm Frick in left-wing publications. ^ a b c d e f g h i j k l m n o p q r s t u v w x y z aa ab ac ad ae af ag ah Fernbach, David (2011). "Introduction". In David Fernbach (ed.). In the Steps of Rosa Luxemburg: Selected Writings of Paul Levi. Chicago: Haymarket Books. ^ a b c d Broué, Pierre (2006). The German Revolution: 1917–1923. Chicago: Haymarket Books. ^ Berduc, Manuel (2016). "Against Putschism: Paul Levi's Politics, the Comintern, and the Problems of a European Revolution 1918-1923". University of Minnesota. ^ See "To Clara Zetkin and Paul Levi"
Grunwald, Henning (2012). Courtroom to Revolutionary Stage Performance and Ideology in Weimar Political Trials. Oxford, UK: Oxford University Press. ISBN 978-0-19-960904-8. Balabanoff, Angelica (1968). Impressions of Lenin.